The empty C=C π* orbital. 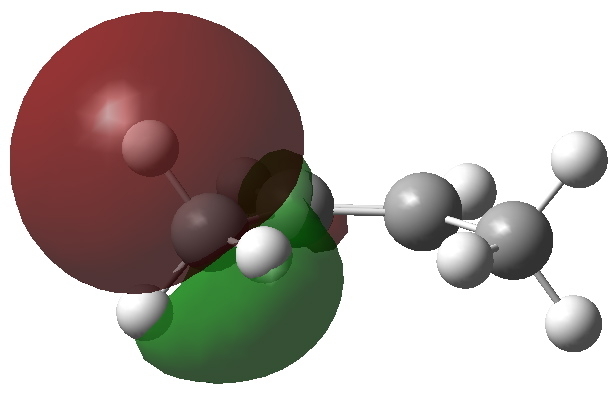 Click for 3D to show both orbitals superimposed. 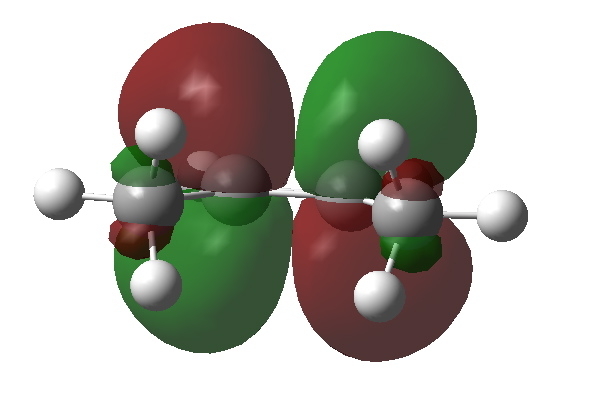 We need to try to “concentrate” or “focus” the effect into the bonds of the molecule, and a good way of doing this is to calculate the NBO (natural bond orbitals). The first we focus on is localised onto one (of four) C-H bonds of the methyl group; the other is the anti bonding π* orbital of the alkene. NBO theory allows us to calculate how these two orbitals perturb each other, in the sense of the occupied orbital donating to the empty orbital. 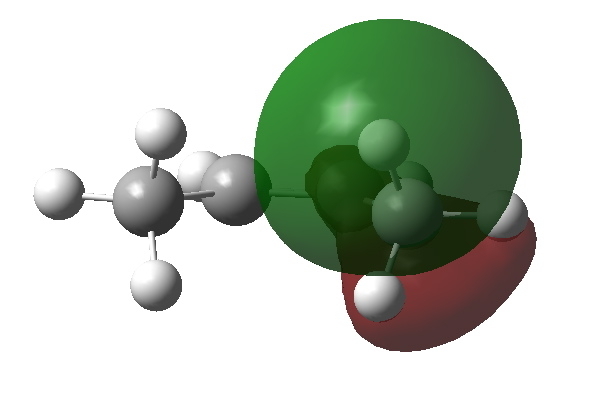 This energy is known as E(2), and for any of the four (equivalent) interactions above, it is computed at 5.17 kcal/mol. 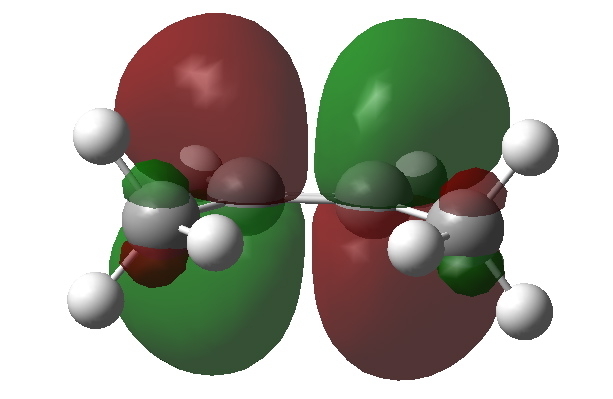 If you look closely at the orbitals, the C-H bond is leaning away from the centre, but so is the π* acceptor orbital (that is the nature of anti bonding orbitals). These characteristics improve the overlap of the orbitals, and hence tend to increase the value of E(2). What about an alternative conformation of cis-butene in which the close contact of the H…H atoms is removed by rotation? Well, the C-H NBOs now rotate in, but the anti bonding π* orbital still tilts out. The overlap between them is no longer quite so good, and indeed the E(2) energy decreases to 4.43 kcal/mol. How many more orbitals should be considered? Well, the NBO technique in effect concentrates these effects into a relatively small number of orbitals (those separated by the smallest energy gap). We can also add in the four interactions between the bonding π orbital and the anti-bonding C-H* NBO. The totals for the first conformation come to 34.08 and for the second 30.44. So we can conclude by observing that cis-butene makes a sacrifice for its greater good. Rotating the methyl groups means that the overlap of four C-H bonds with the alkene is optimised, but an undesired side effect is to induce two hydrogens to get close to each other. They would not normally be happy doing so, but the gain from the first effect is greater than the loss from the second. Whilst they may be close, chemists would prefer not to call the H-H approach a bond, even though the topology of the electron density might say it is. By the way, this is my 150th post. I had little idea when I started that I might reach this milestone. This entry was posted on Monday, October 10th, 2011 at 3:37 pm and is filed under General, Interesting chemistry. You can follow any responses to this entry through the RSS 2.0 feed. You can leave a response, or trackback from your own site.